Page 1. Am I an unconventional Type? Lenore's "Personality Type: An Owner’s Manual" explains the principles underlying the different ways people grant meaning to their experience, how and where they invest psychological energy, how they become conscious and self-aware, and how they prefer to adapt to their environment. By showing the point of view each type brings to various life tasks, ranging from getting a seat on the subway during rush hour to crucial ethical decisions, Lenore reveals each type’s characteristic defenses and the way all types struggle to reconcile their inner psychological conflicts. Her stories exemplify the way our common human nature diversifies into types that challenge each other's compassion. Such compelling stories come only from lived experience integrated with profound knowledge of science, religion, and the arts, including pop culture. Through humor and cautionary tales, the book guides us away from simplistic trait-based models of personality to dynamic type development over a lifetime. Jeanne Marlowe, a type consultant who has worked with Lenore for 8 years, starts the dialogue. See Jeanne's articles Archetypes: the Next Step After Type and A conversation with Kathryn Myers. JM: Let's leap right into the heart of the matter. What is a psychological type? LTB: I think I'd like to start with what a psychological type isn't. I want to be up front about how I understand type theory, because otherwise what I say about it won't make much sense. I don't believe that type refers to a person's innate personality characteristics. It isn't the causal source of a person's needs or the behaviors designed to meet them. Rather, type is the outcome of habituated choices -- our accustomed orientation to incoming information. Of course, some of our choices are going to favor our temperament, in so far as temperament means our basic chemistry, but knowing our type won't tell us what job we're best suited to do or what kind of marriage partner we ought to seek. Type tells us how we generally adapt, particularly when a situation is unfamiliar. It tells us what we're most likely to recognize as important about a situation, what that means to us, and what strategies we use to manage it. The universe, after all, is a blooming, buzzing, ever-changing field of information. We can't take in everything that exists. Every situation requires that we make choices. If we recognize something as important, we're setting aside other things as less important, or screening them out altogether. This isn't a sign of dysfunction. It's the way we're made. The very purpose of having a nervous system is to narrow our receptive capacity to data that ensures our comfort and survival. From time immemorial, various temperament theories have attempted to classify human personality in these terms, assuming that people have different kinds of nervous systems, which give rise to different kinds of emotional dispositions. For example, some people enjoy risk, others seek harmony; some people want responsibility, others enjoy change. The validity of these classification systems, however, is undermined by the corollary assumption that people's behaviors issue directly from their affective needs, reflecting the natural way such needs can be met. C. G. Jung, the analyst who came up with the theory of psychological types, objected to this assumption. He was loathe to credit people's choices entirely to affective disposition, as though people could be pegged by a label, and consciousness were an expedient illusion. He pointed out, in fact, that when our behaviors do issue from immediate needs outside our conscious control, we don't identify these actions with preference or authenticity. Rather, we feel precisely as though we're out of control. Therefore, Jung focused on the part of the psyche that is making this judgment -- the "I" that results from making free-will decisions, the choices that make us feel like "ourselves." A type test is trying to get at these free-will decisions -- do you see yourself as cool-headed or warm-hearted; do you like deadlines or do they get in the way? These choices can't be traced backwards into core emotional needs that demand behavioral compliance. Rather, they point ahead -- to goals that we set ourselves in a particular time and place, the ways in which we deliberately narrow our receptive field to information that we value. 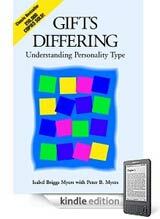 JM: Thank you for getting at what seems to me two chief concerns of Isabel Myers, the inventor of the Myers-Briggs Type Indicator. She emphasized that her questionnaire does not indicate skill and was horrified when a bank misused it to fire all its employees preferring intuition. She also insisted that type knowledge could help people become aware of more choices so that they could "cross from the natural to the appropriate" (Gifts Differing, 1980, p. 118). LTB: I like that phrasing -- crossing from the natural to the appropriate. There is little question that we naturally value options that ensure our comfort and survival. Our choices will normally favor our felt strengths and the things we like to do. But what makes us recognizably human is the fact that value accrues to more than issues of pleasure and survival. It's our capacity to override our immediate affective needs for the sake of principles and ideals that enables us to establish a sense of self with a narrative history. To credit our principles or ideals to innate disposition sets up a social caste system rather than a natural taxonomy. This becomes clear when type theory is employed to locate people's ostensible places in the institutions we already take for granted. The purpose of type theory is to make us aware of the self-experience we ordinarily inhabit. It takes us outside that self-experience to get a vantage point on habituated strategies of adaptation. Thus, we can see ourselves more objectively, understanding what our choices say about our direction, our self-imposed limitations, and the cultural environment we take for granted. It may be noted that a sense of self is a cognitive phenomenon. This is why Jung's theory doesn't traffic in social stereotypes. Rather, it recognizes four cognitive standpoints, which exist in all of us. Jung called these standpoints functions, naming them as Sensation, Intuition, Feeling, and Thinking. These terms don't refer, in any way, to the entire human psyche. They don't mean senses, imagination, emotion, and intellect. Rather, they refer to the kinds of information the cognitive mind derives from our bodily and emotional experiences -- respectively, aesthetics, symbols, ideals, and concepts. In Jung's theory, aesthetics and symbols are opposites; you can't clarify what's immediately apparent (Sensation) at the same time you're inferring what isn't yet apparent (Intuition). In the same way, ideals and concepts are opposites; you can't determine something's value to you personally (Feeling) at the same time you're classifying it impersonally (Thinking). One is always choosing between these opposites, granting one more importance than the other. To have a psychological type means that one of these four cognitive standpoints has become habituated. We're less aware of options connected with its opposite, and the other standpoints are subordinated to our dominant one, supporting our goals, or balancing them with information that is less immediately conscious. To some extent, of course, our preferred orientation takes shape naturally, as we experience our felt strengths and find options to express them. But this is different from saying that type is innately determined. At birth, the brain has neurological potential for many different environmental options, and it structures itself on the basis of our actual choices -- about where to focus our attention, what we like and dislike, and what meaning we assign to our experiences. Although these choices will certainly favor our chemistry, our proclivity to anxiety or aggression, our interests, our fears, and our abilities, they also reflect the expectations of others, the possibilities we recognize or create for ourselves, and the gradual development of our character -- the standards we maintain, even when they *don't* favor our immediate affective needs.